Law students relaunch newspaper to tackle transformation of their school and profession. The Wits Law Student’s Council’s (LSC) newspaper has been relaunched after an absence of almost 30 years. The launch took place outside the Olive Schreiner Building of the Wits School of Law, on Monday, September 10, with a print run of 250 copies. The student-run publication, Dumelang, which means ‘hello’ in seSotho, was previously known as De Minimis, a Latin expression meaning ‘About Minimal Things’, which comes from the maxim: ‘De Minimis Non Curat Lex’, which translates to ‘The law does not concern itself with trivial issues’. The focus for this month’s 12-page tabloid is on gender and includes articles by law students as well as Wits School of Law professors and lecturers that addressed issues such as gender binaries, the representation of women in law, women’s rights and the transformation of the South African legal system. Media officer of the LSC, Neville van der Spuy, who is also the editor of the publication, explained that the newspaper had existed in the constitution of the LSC since the 1930s. “Since its inception, the paper had not been produced on a regular basis and the last known physical print that we as the Wits LSC have been able to obtain is from March 1989,which is featured on our front page. 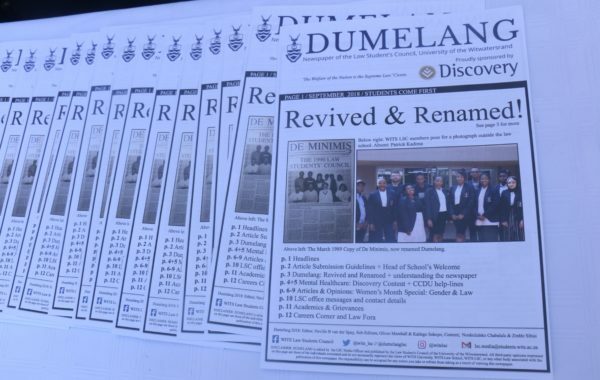 “We have brought back what used to be called De Minimis, now Dumelang, which is a publication we use to communicate the LSC’s objectives as well as to create news,” said the third-year BA Law student. LSC chairperson Nolwandle Hadebe, a third-year LLB student, said that the relaunch of the publication was necessary for transformation purposes. “We understand and appreciate the objective of the paper but we do not appreciate its history, hence we gave it a transformative name, Dumelang,” she said. Hadebe told Wits Vuvuzela that the paper would aim to broaden the legal fraternity. “The new vision is to transform law because it is very Western. That is why the next issue of the publication will focus on customary law in South Africa and to try and get this law as a course in law school,” she added. Law professor Elsje Bonthuys contributed an article titled ‘Gendered Binaries in Legal Logic’ which discusses issues such as how property law, where males exercise control over their female counterparts, can be extended to human aspects. She told Wits Vuvuzela that she was impressed by the students and their interest in a wide variety of issues. “I have written in this first issue and If I am asked again, I will definitely do so. I think that a variety of people should also be involved in providing content. Everyone from law students, law lecturers and law practitioners, in order to give students an idea of what they can do in practice,” she said. The newly revived newspaper is funded by Discovery Health and includes information on mental health for students as well as a careers corner which informs students about future opportunities and what they can do with their law degrees. Igenda Ejekwu, a fourth-year LLB student, said that having this publication would be very helpful in giving law students a sense of direction. “This paper will assist us by informing us about different opportunities that might arise in different law firms.It will also help us understand what our main focuses are as law students,” he said. Van de Spuy said that the newspaper would be published every eight weeks. Although no date has been set, the next issue will be available by the end of October.